When Oldham hat manufacturer, Thomas Henshaw, died in 1810 he left the sum of £20,000 to establish an 'Asylum for the Indigent Blind'. The will was contested by his wife, Sarah, who claimed that it had been made made while Henshaw was 'mentally unbalanced'. After 23 years of legal wrangling, the Court of Chancery finally gave a ruling endorsing the original will. 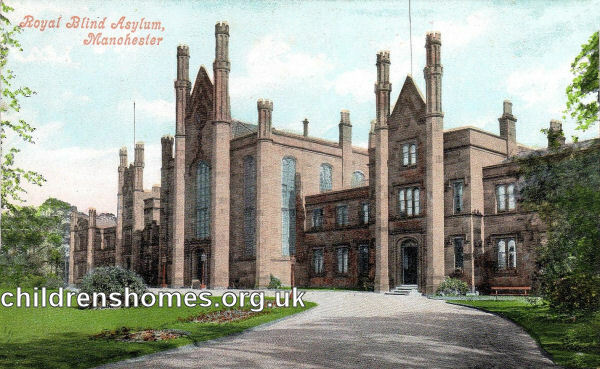 A site for Asylum was found at Boyer Street, Old Trafford, Manchester, where new premises for the Institution for the Deaf and Dumb were also planned to be erected. The space between the two establishments was occupied by a chapel, to be used by both institutions. The foundation stone for the scheme was laid on 23 March 1836, with the official opening taking place on 21 June 1837. The School site is shown on the 1915 map below. Henshaw's Institution for the Blind site, Manchester, c.1915. Henshaw's received both adults and children. The object of the establishment was stated as being 'To afford an asylum for the impotent and aged blind, and to maintain and afford such instruction to the indigent blind of both sexes capable of employment as will enable them to provide either wholly or in part for their own subsistence, and to promote the employment of, or to employ, blind persons.' Admission was by a periodic ballot of subscribers to the funds of the Asylum. Children were admitted from the age of nine years. The premises originally house 37 inmates but were gradually expanded, with a large new building being opened in 1887. In the same year, workshops were opened in Salford. However, these proved to be too small and expensive and were relocated to Deansgate in 1891. A large warehouse was subsequently purchased in Stretford, and a shop selling items made by the Asylum inmates was opened in Oxford Road. The Asylum also established an elementary school for blind children aged 5 to 16 and a technical college for students from 16 to 21 who were trained for occupations such as music or craftwork. 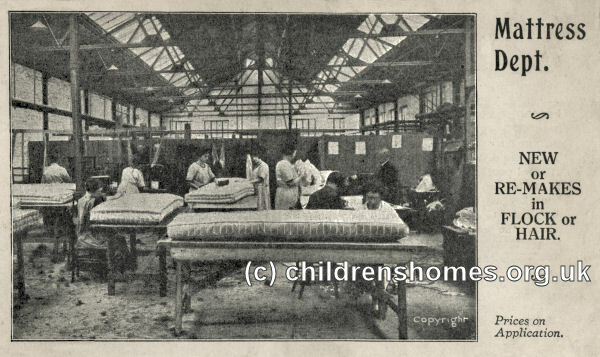 One of the occupations carried out at the Asylum was mattress making. A promotional card for the work is shown below. In 1921, the Asylum was renamed Henshaw's Institution for the Blind and by the 1930s was the largest establishment of its kind in the country. In more recent times, Henshaw's has broadened its activities, with a service for the visually impaired as well as the blind beginning in 1971. At the same time, the Institution changed its name to Henshaw's Society for the Blind, and again in 2000 to Henshaw's Society for Blind People. Today, known simply as Henshaws, the charity provides a wide range of services for the blind and visually impaired across the Northern England and Wales. Manchester University Library Special Collections, The John Rylands Library, 150 Deansgate, Manchester M3 3EH. Has financial accounts, committee minutes etc.